It's so confusing! I suggest everyone start using the Norwegian terminology, which is pure logic. Thanks for the guide, though! Thank you. This was so helpful. 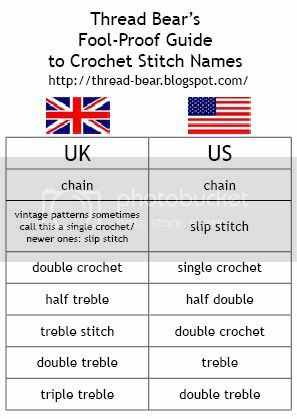 I live in the US and have been picking up the new UK magazine INSIDE CROCHET, when I decided try a pattern and got a little bewildered. How ever the first issues has sort of a guide but I think there is a misprint in it. But all in all the magazine is wonderful. Just a little pricey for me. Thanks Again.